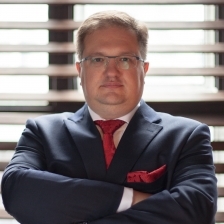 Managing partner, expert in complex international tax and civil law, asset management and financial engineering expert. Graduated Russian University of Peoples’ Friendship as “Lawyer”, Russian Financial Academy named Plekhanov as Master of Business Administration (MBA), Swiss Finance Institute as Financial Asset Management Engineer, also graduated Moscow Technical University of Communications and Informatics as engineer-programmer. Expert in Tax Council of Russian Federation Chamber of Commerce and Industry.